HAZ approached I-AM with a directive to breathe new life into their five-strong group of restaurants. HAZ owner and founding partner Zafer Cicek approached I-AM with a very clear directive to revolutionise and breathe new life into his five-strong group of restaurants, making them more relevant to the increasingly youthful and affluent target city slicker, without losing the spirit of the brand that has retained a loyal following since HAZ was founded in 2001. I-AM were asked to help define an experience to take customers to the heart of modern day Turkey, leaving the monotony of city life at the door. To do this, I-AM refined Haz's brand identity and experience offering. 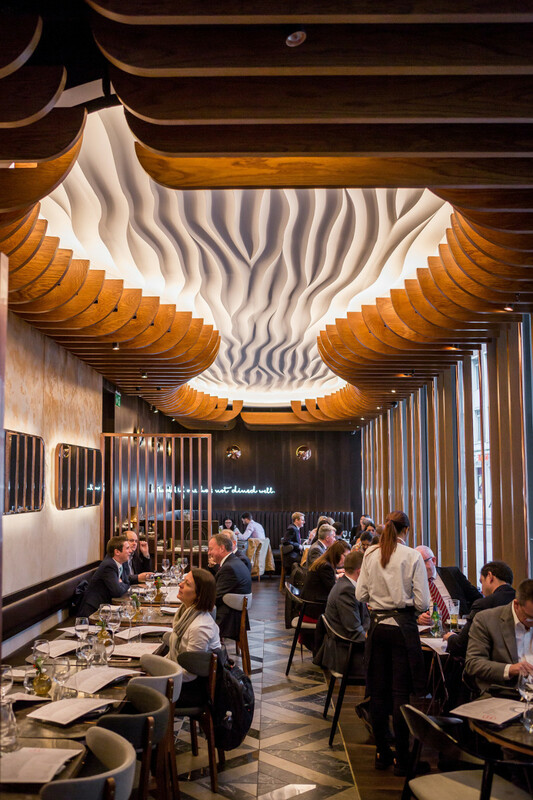 In a nutshell, the brief was to position Haz Restaurant in Mincing Lane as the number one restaurant serving quality Turkish food in central London. From a consumer insight perspective I-AM was mindful that Instagrammable experiences and environments continue to be key for the modern cosmopolitan consumer. 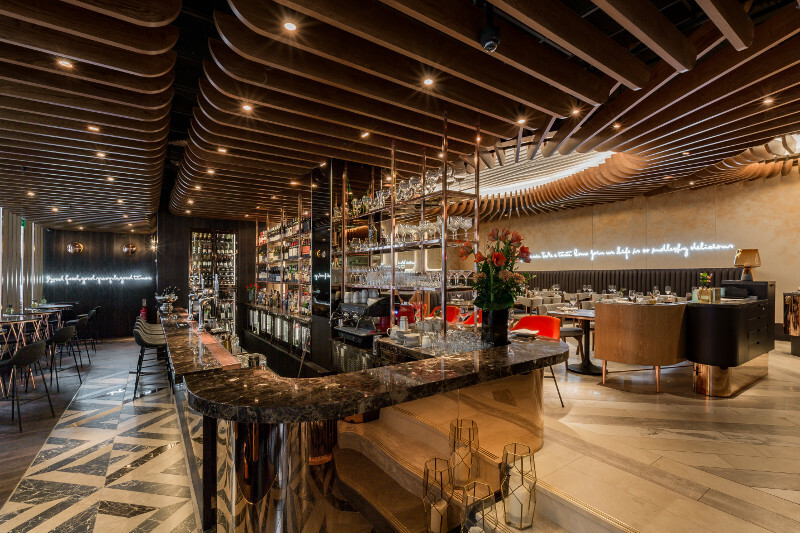 Therefore, I-AM designed a space that was gram’ worthy with its sophisticated menu and opulent setting. The range of services provided included: brand identity, visual language, brand architecture, signage and application, interior design and web design. 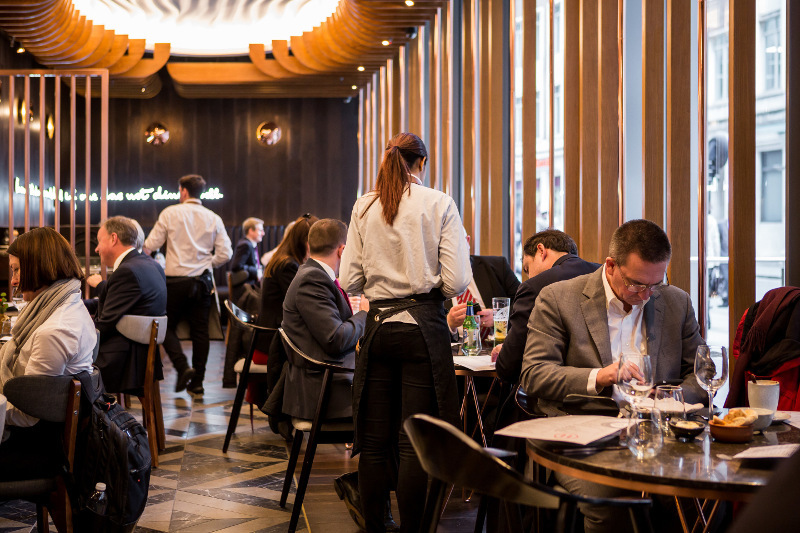 The project was finished at the end of last February and the restaurant is located at Plantation Place, 6 Mincing Lane, London, EC3M 3BD. 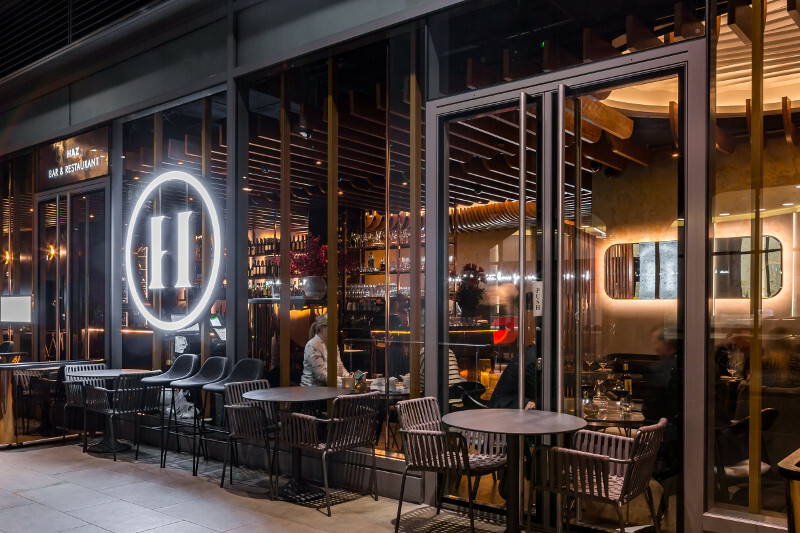 We worked on a holistic approach, which involved crafting the identity of HAZ across various Customer Journey touchpoints; conveying HAZ’s identity in the design of the space and any consumer facing communications, from graphics to interactions within the restaurant and online. In conjunction with brand and visual development, a new contemporary menu was developed alongside leading chef Niall Davidson. The restaurant concept is inspired by the art of Turkish Coffee, a balance between bitter and sweet, translated by light and dark areas to the restaurant; with intimate dining spaces at the front of the restaurant (the bitter), that transcend into the lighter, main dining area (the sweet cream). An emphasis has intentionally been placed on the bar offer stretching across the entrance to entice guests to return for an after-work cocktail or two. The new material palette comprises of sophisticated burnt-cocoa tones, sweet creams and highlights of coral, a metaphor for the bold spirit and distinguished elegance of HAZ. Our extensive experience in designing eateries,bars, restaurants and cafes makes us best placed to get incredible results. Not only have our team done this before but we’ve done it before together. 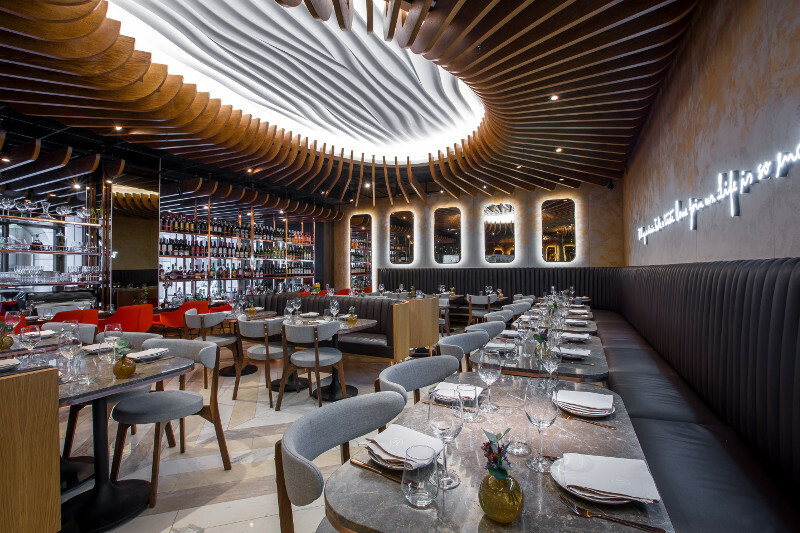 The restaurant is laced with hints of gold and copper, from the lighting and bar design, right down to the menu visuals, inspired by the burning embers when cooking. The functional layout enhances the opulent atmosphere, as guests are treated to the theatrical performance of an open kitchen. Whilst the overall architecture is welcoming and engaging, the sense of opulence is an integral part of the customer journey. HAZ is a much loved and well-established restaurant chain with five locations across the heart of London’s historic financial district, serving up a traditional Turkish menu in a formal but dated restaurant environment that lacked character and appeal beyond the normal city lunchtime banquet. The revamped identity needed to reflect HAZ as a vibrant, generous, and sociable brand that engages people in a positive and confident way, thereby elevating the brand beyond the mid-market casual dining market offering. A concept enthused by the art of Turkish coffee, the restaurant’s ceiling has an undulating design, created to reflect the ripples of the coffee and deliver an energy through the space. It is an absolute design revolution for the brand, elevating a well-established but very dated mid-level eatery into fine dining experiences, through a revitalised menu, a consistent approach to the brand execution across all touch-points and a bespoke level of detailing for all furniture and features. 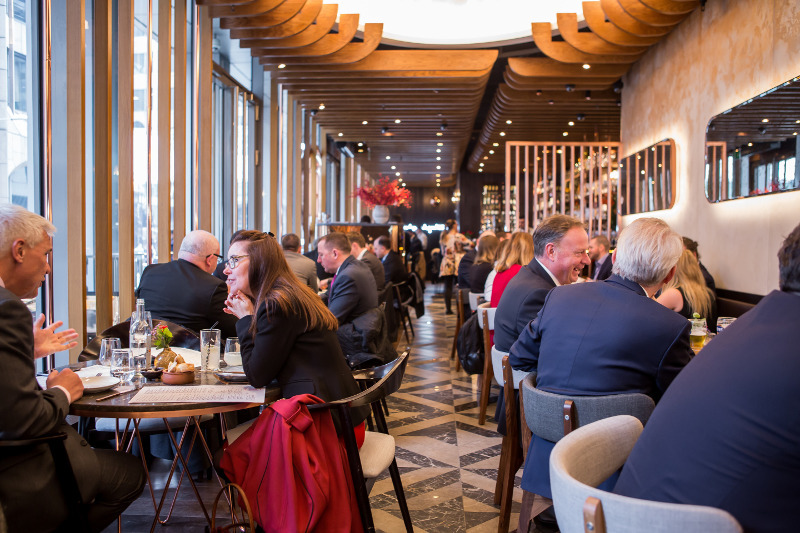 The restaurant experience is tailored to suit the needs of the city clientele at various times of the day, and offers and environment that is both fast-casual and refined. Ceramic Floor: Domus tiles – multiple Timber Floor: Ted Todd Liquorice European Oak Planks Timber Walls: Ted Todd Liquorice European Oak Planks Wall panels: Bespoke by Armourcoat Ceiling panels: Armourcoat Sculptural Flow XL Lighting: Bespoke by Nulty Bespoke Banquet Seating: Bespoke by Parla Design Kitchen & Bar by iFour.